In the tradition of his best-selling alphabet book, Animalia, author and illustrator Graeme Base takes young readers on an exhilarating journey of discovery with an ingenious fusion of counting book, puzzle book, storybook, and art book. From the plains of Africa and the jungles of the Amazon to the woodlands of North America and the deserts of outback Australia, the animals come together to drink from the water hole. But their water supply is diminishing. What’s going on? 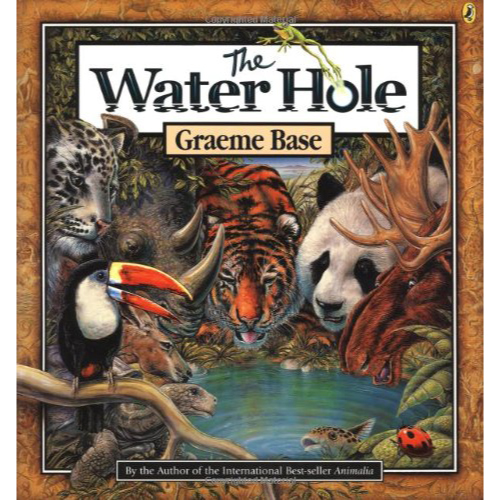 Each sumptuous landscape illustration conceals hidden animal pictures for readers to find as they count the animals that visit the water hole and try to solve the mystery: will the animals come back or is their water source gone forever? By Graeme Base.